I’m paddling through a minefield. Not a dangerous one mind you. Not one that threatens me immediate harm. No, this is a magic minefield. A minefield of humpbacks. They’re serenading me, us. Every few seconds we hear another breathe. 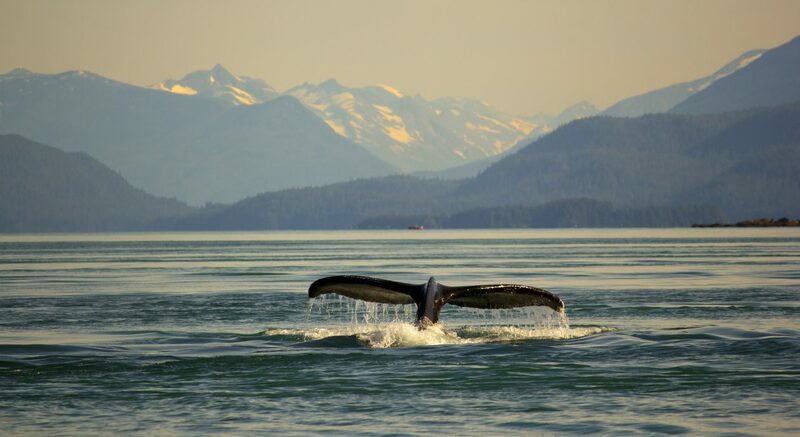 The water’s north of Young Island in Glacier Bay are full of them. How many? Five? Ten? Twenty? Thousands? It doesn’t matter. They are many. They are here. They are near. To the left of our kayaks the latest whale breaks the surface. He’s fifty yards away, his nose pointed straight at us. My God. For the millionth time in my life I watch the back arch, the body hesitate, and the tail rise high in the air. As tall and proud as a Spanish clipper. She’s diving straight towards us. My heart pounds, my legs feel weak. I strike the surface with my paddle, my stroke noisy. I want him to know where I am. For there to be no doubt. We point the bows of our kayak towards the nearest point of land half a mile away. There’s nothing to do but paddle, our course subject to change. Subject to change… I’ve heard that before. Or did I read it? I read it. Just this morning, killing time before the trip. Pouring over the nautical charts of Glacier Bay. The maps that make my mind race and imagination cartwheel. All of this magic bay’s coves and inlets. Here a delineation in the shoreline. A potential beach to pull out on. A potential site for a miracle to occur, for a life to change. At the base of a glacier, represented by white are the words: “area subject to change.” Subject to change, I love that. As if NOAA finally threw up their hands and gave up. Perhaps the bay is still speaking to us. Out of the mouths of the epochs with the voice of the ice age. Reminding us, prodding us to not get comfortable. We need upheaval, to be subject to change. To not just wait for the significant calving events of life, but to embrace them. We need galloping glaciers but we need retreating ones too. The wisdom and strength to accept them. Five minutes go by. Still no whale. He could be in front of us, behind us, below us. Every stroke could be bringing us into her path or away from it. In a kayak there’s nothing to do but paddle. With me is a family of four. Mom, Dad, their college aged son and daughter. From the mountains of Utah. But they paddle strong, their hearts are wild, their minds open. Glacier Bay is rocking some minds today. I hope it’s doing the same to them. Somewhere is a forty foot submarine. Carbon based, cloaked in blubber, eating half a ton of food per day. I don’t want to distract her. Attached to her tail is a muscle. The caudal peduncle. Fun to say, but it fails to give credit to what it can do. It’s the strongest muscle in the animal kingdom. To send a humpback rocketing from the water like a rocket it generates the same amount of energy a 747 does taking off. Anything carrying that sort of power needs respect, demands it. Teeth or baleen. Three miles up the Lamplugh Glacier. The site of a massive rock slide. Last Sunday half a mountain fell onto the glacier. How much? 68 million SUV’s worth. Who knew a sport utility vehicle could be such a great unit of measurement. They’re the passenger of the glacier now. Of the most powerful geologic force nature can muster. You can have your volcanoes, your earthquakes. Give me the glacier. Carving, destroying, creating. In no hurry. For what artist works on any schedule but its own? The news makes me quiver. I take some radical steps, a few creative liberties. What happens when that rock reaches the glacier’s face? It will surely fall to its feet. 68 million SUVs worth. But I know how glacier’s advance. They need a protective layer of rock and dirt at their base. A lateral moraine that insulates from the salt water. If enough snowfall is accumulated above, the glacier can advance, impervious to the melting power of the saltwater. What if the Lamplugh charges… no, gallops, a galloping glacier sounds better. What if it charges across the west arm, obliviating Russell Island and roars south, changing everything about Glacier Bay that we’ve known for 50 years. What if this simple rock slides makes my world, this bay, subject to change? Still no whale. I glance at my watch. Eight and a half minutes. The unknown more nerve wracking than the knowing. Every few strokes I tap the side of my boat. I hope my taping transmits this message. A rumble, a deep bass. I swivel around. There she is. Close, so close. Fifty yards. Pointed straight at us again. She’s massive. Of course she is. Humpbacks exhibit sexual dimorphism, the females bigger than the males. Guide mode switched on, I almost blurt out the factoid for no good reason. “Right behind us!” I call. I try to keep my voice calm. But how are you calm with forty tons directed right at you? Ahead of us is the kelp, the closest thing to a sanctuary. This is my world. Wanting, desiring, craving to be close… but not too close. I still want control of the situation, to know that I’m out of the way. She couldn’t care less. We paddle hard, the whale invisible behind us. Forty feet that disappears with nary a ripple. Add it to the list of Glacier Bay miracles. We reach the kelp’s open arms and I exhale. The family coasts in behind me. Their faces are alive. Exhilaration with a sprinkle of fear. Perfect, just the way it should be. Just the way Glacier Bay, Alaska as a whole expects it. I don’t want to feel safe out here. I don’t want to be in charge. Thank God there are still places where man does not dominate. We paddle on. For that’s all you do in a kayak. I glance at the daughter. She’s in the back of the double kayak, her father in the front. She’s not that much older than I was on a certain misty and overcast day in Johnstone Strait, British Columbia. The day everything changed. When an Orca by the name of Kaikash surfaced off the bow of my kayak and sent the compass of my world spinning out of control. Who knows whose life will change with the flip of a switch, with a single surfacing, a single rock slide, a single galloping glacier. But when it does, who will be brave enough to accept it and embrace it with open arms.